How can I draw a vector field (quiver plot) on a surface in 3D? 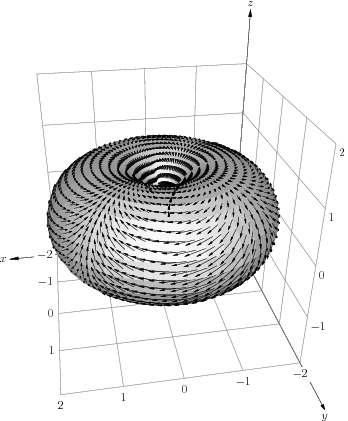 I'd like to draw a vector field on a torus using PGFPlots and/or TikZ. I managed to do it using ePiX, based on the file decorate.xp from the example gallery, but then I have to do z-sorting by hand, which is very ugly. How can I get PGFPlots and/or TikZ to give the same result? 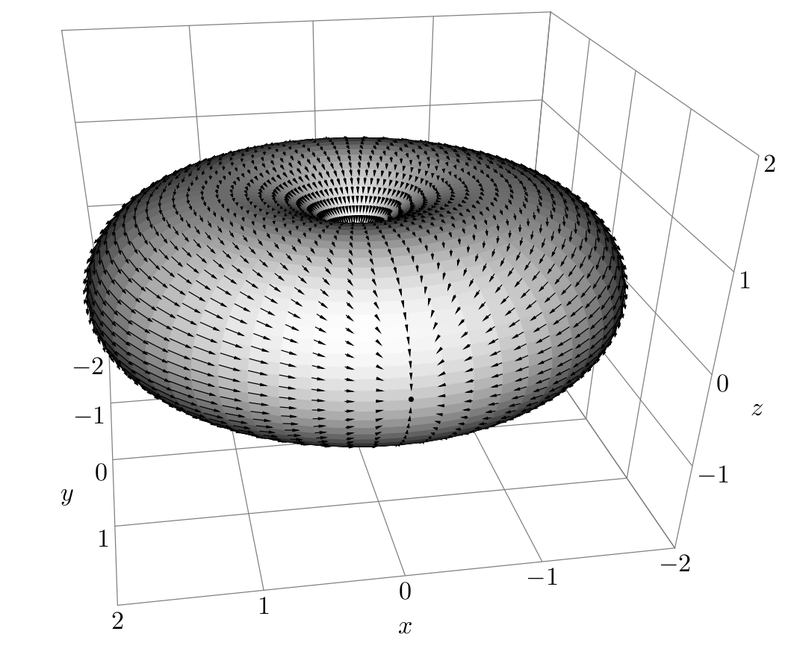 It seems to me that PGFPlots can plot the vector field using quiver, and plot the torus as a surf, but not both at once. Is it possible to get around this by chopping up the drawing into smaller pieces? How should I do that? NB: The code is a hack, and is probably badly written and formatted. Any tips for improving the figure and/or code are appreciated! The strategy is to plot the surface first, then to overlay the vectors manually; vec_field() draws individual arrows, draw_surface() does the overlaying. The scene is manually chopped into three blocks to fine-tune the hidden object removal (see comments). The vector field is specified by my_F(), and may be changed as needed. The return value should be a periodic, pair-valued function of u and v.
What about directly exporting your matlab figure to Tikz? Then you can do some further formatting in the generated tikz file.